Click on the staff member's name to read their bio. Erika has twenty years experience working with children, youth, and families in both the Child Welfare and Juvenile Justice arenas. This has been by way of voluntary agencies, Local Departments of Social Services, and as a University partner to the Office of Children and Family Services (OCFS). She was most recently a Training Program Coordinator in the Child Welfare Department at the Professional Development Program (PDP) where she coordinated multiple training projects regarding best practice service provision to adolescents in out-of-home placement and several youth voice Initiatives. She specialized in the following areas: evidence-based culturally competent trauma-informed care, safety and permanence, and promoting the achievement of positive measurable outcomes. She joined the PCANY team in August of 2015. Her Masters Degree is in Social Policy and professional experience includes service as a youth care worker for court placed adolescents in congregate care, child protective/foster care caseworker, foster parent home-finder and trainer, and life skill coordinator. She was actively involved in youth leadership and positive youth development initiatives and coordinated the efforts of the New York State Foster Care Youth Leadership Team, Youth In Progress. Ellen has been with the team since 2004. In her role, she provides support to team members on their training and quality assurance work. In her direct work with programs, she provides training and technical assistance to supervisors and program managers, prenatal training, and FSW quality assurance/site support visits to programs. She relishes the opportunity to help guide managers and supervisors in their professional development as it relates to the parallel process, practicing reflective practice, nurturing and retaining staff and learning the nuts and bolts of their jobs. Prior to joining the team, Ellen was Director of Community Services for Mid Hudson Family Health Institute where she initiated and oversaw the Healthy Families and Community Health Worker programs in two counties. Before joining HFNY, Ellen worked with migrant farm workers in rural North Carolina, women and families affected by HIV in Newburgh, NY, and as a home visitor to families in Washington, DC. Ellen also spent 3 years in Honduras in the U.S. Peace Corps working with women’s groups on income generating and health projects. Ellen has dual master’s degrees in Public Health and Social Work from the University of North Carolina at Chapel Hill. Manouska has been with Healthy Families for over ten years and joined the training team in December of 2015. She was the program supervisor for Newburgh Healthy Families for seven years. She played the role as a mentor, leader, educator, and a support to her staff members while maintaining a high level of professionalism. She is extremely passionate about providing services to the at-risk expectant and new parents in her community. She graduated with a Bachelor degree in Human Services at Mount Saint Mary College. She is also currently attending Adelphi University to pursue her Masters in Social Work. Additionally, she is a member of various committees in her community such as member of the Youth Bureau, Team Newburgh, Corporate Complaint/Auditing Monitoring committee, and member of Community Outreach as well as Cultural Diversity Trainer. Lisa was with an accredited Healthy Families program since 1995. She served as the Program Manager from 2000-2017. Previous to that, she was a supervisor, Family Support Worker, and Family Assessment Worker at various times. Lisa has experience training staff and other groups in various manners. Most notably, she is a certified trainer for the University of Connecticutï¿½s Empowerment Skills for Leaders curriculum. This curriculum originated at Cornell University as a component of the Family Development Credential Curriculum. Lisa has a bachelorï¿½s degree in Psychology and additional training in infant mental health and early brain development through her years with Healthy Families. She served as her programï¿½s Child Development Specialist. Prior to working with Healthy Families, she was a home visitor with another local program supporting families at risk of losing custody of their children. Overall, she has 24 years of experience working with families of different circumstances to reduce their stresses and prevent child abuse and neglect. Isabel graduated with a Bachelor of Arts Degree in Psychology from Mount Saint Mary College. Isabel has over 16 years of prior experience in the Human Services field. She began her work as a Youth Advocate supporting youth that were at risk of Residential placement, and transitioned into the Mental Health field where she added to her experience Case Management and Mental Health Crisis work. She maintained her role as a Mental Health Crisis worker for over 10 years. She joined Healthy Families New York as a Supervisor in Orange County, NY. Isabel supervised both Family Assessment Workers and Family Support Workers. During that time, Isabel added to her knowledge of child development, psychology, and social interventions. As a Preventive Supervisor, Isabel also provided internal trainings for the agencyï¿½s staff. She found that facilitating trainings versus teaching the staff was the most effective method to their Professional and social development. Currently, as a Healthy Families Training and Workforce Development Specialist, Isabel continues to work towards supporting the Healthy Families America mission to promote child well-being and prevent abuse and neglect. Caroline is a Training and Staff Development Specialist and has been with the program since 2008. In her role, she primarily focuses on visiting programs all over New York State to provide FAW, FSW and Supervisor Quality Assurance/Site Support visits. In addition, she has the opportunity to conduct the FGP training. Caroline is part of developing and facilitating the annual Advanced FAW and all staff regional training days. Prior to joining the team, Caroline was with the Ulster County Healthy Families Program for 8 years. In her time there, she had the opportunity to fill many roles (FSW Supervisor, Home Visiting Coordinator and Program Manager). Caroline also worked as a Family Specialist for 10 years with youth and their families in a therapeutic foster care program and as a case manager for UARC working with individuals with developmental disabilities. One of Caroline’s favorite parts of being on the team is the opportunity to go into the field and directly observe the tremendous work that is being done in programs and to be able to provide opportunities for staff to step back and reflect on their practice. While she conducts various trainings for HFNY staff, Fatima’s primary role on the team is to develop and implement training opportunities for Family Assessment Workers. She also tours the program sites throughout NY State conducting quality assurance visits. This practice assists program managers and supervisors to ensure that their staff is effectively implementing the learned skills and techniques of conducting the Kempe assessment/Parent Survey and relaying that information for ongoing program service. Fatima has been on the training team since 1997. Before joining the team, for six years she was the Program Manager for the Albany County Healthy Families Program. The Albany program was one of nine programs to initiate Healthy Families in New York State with the goal of demonstrating to the State Legislature that participation in HFNY would result in improved outcomes for children and families in NYS. Fatima shares that her favorite part about being on the training team is the opportunity it gives her to work with all of our HFNY programs. As a Program Manager/Trainer, she spent several years visiting sites across NY State and the country and was always eager to bring back new techniques and best practice ideas to program staff. In this position, she continues to tour sites, hear about and witness firsthand the fabulous impact this program model has on children and families across the state. Fatima believes that HFNY stands a cut above other HF programs throughout the US in our implementation of strength-based practice and father involvement. She is proud to be part of, and to work with, a team and colleagues throughout this state who value these philosophies and work to incorporate both in all aspects of service provision. James was a FAW/FSW Supervisor at Ulster County Healthy Families before joining the PCANY training team in March of 2015. He’s worked in the field of social services for over 25 years, including 10 years as a caseworker and supervisor for therapeutic foster care program. James has a passion for reflective communication skills, group facilitation, and personal development. In addition to his work for PCANY, James leads personal growth workshops for teenagers throughout the Hudson Valley. In his free time James enjoys spending time with his son, hiking and visiting museums and art galleries. Tina is currently the Program Associate for the Training Team at PCANY, coordinating and organizing the many different logistical aspects of all the trainings the team provides around the state. Tina has an academic background in Sociology and Child Development, and has previously spent many years working in two Healthy Families NY programs. Click on the image above to view the current Training Calendar. 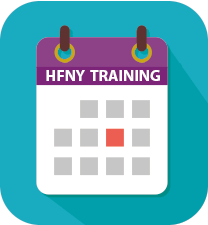 New and cross-trained staff at HFNY Home Visiting Program sites will be oriented and prepared for their roles through basic training for Family Assessment Workers (FAW), Family Support Workers (FSW), Supervisors, and Program Managers. The skills and knowledge of staff at all sites will be further developed through Prenatal, Family Goal Plan (FGP), and other introductory and advanced training events. Contact Tina Tison for more information or to be added to the distribution list. Healthy Families America training webinars (Family Goal Plan, Prenatal, and CHEEERS). Helpful HFNY Abbreviation Job Aid.